An Austin, Texas-based company that essentially operates hotels within large apartment buildings is preparing to enter the Denver market. 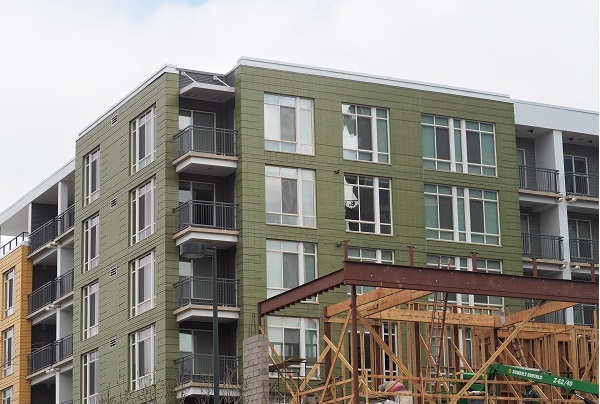 The Guild — which operates in Austin, Cincinnati, Dallas and Miami — has a page on its website for “The Guild Union Station,” which it expects to operate at 1750 Little Raven St.
That’s the address of AMLI Riverfront Green, an approximately 300-unit apartment complex nearing completion in the Riverfront Park neighborhood. Online city permit records indicate The Guild wants to operate 41 units in the complex, which tops out at seven stories, as hotel rooms. The other units would be rented out on traditional leases. 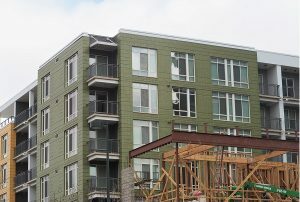 AMLI’s website indicates units will be available to residents starting May 1, and lists rents that start at $1,880 a month for a studio. The Guild did not respond to a request for comment, and a local executive with ALMI did not return a voicemail. The Guild said last fall, when it closed a $9 million funding round, that it was planning to expand to Denver. A specific location has not been reported. Here’s how the company’s model works in Cincinnati, according to the Cincinnati Enquirer: The Guild has leased 50 of 300 units in a complex known as Current on the Banks, which it then turns around and rents to tourists and business travelers on a short-term basis. The Guild said the arrangement gives travelers more home-like amenities, and has gone so far as to set up a concierge desk within the complex for its guests. The complex has approximately 300 units. Residents in the rest of the complex receive incentives for living alongside short-term visitors, including discounted rates at other Guild properties, according to the Cincinnati Business Courier. Guild co-founder Brian Carrico told the Austin Business Journal in October that the company wants to have 300 units in Denver, meaning its plans go well beyond AMLI Riverfront Green. “We see this as an opportunity to redefine what it means to be a hotel in light of Airbnb,” Carrico said of the company’s model. The Guild isn’t alone in taking a new approach to the lodging industry. San Francisco-based Sonder, which has a similar model, recently opened a hotel-Airbnb hybrid in a former hostel in Denver’s Uptown neighborhood. Unlike The Guild, however, Sonder has leased the entire building in Uptown, and isn’t pairing short-term visitors with long-term residents. 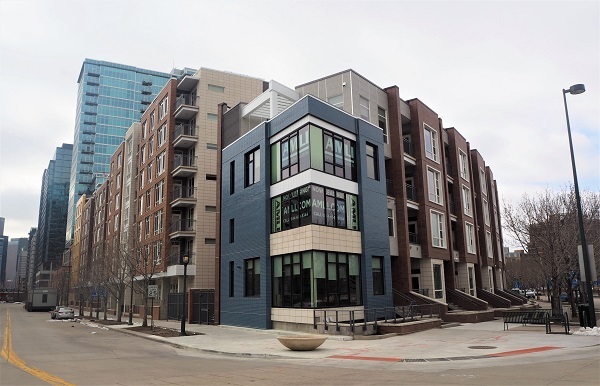 In Uptown, Sonder applied for and received a lodging facility license from the city. That’s the same type of license a traditional hotel gets, not the short-term rental license needed by most people renting on Airbnb. By getting the lodging facility license, Sonder avoids the “primary residence” requirement associated with a short-term rental license. The Guild’s business model suggests it also would want a lodging facility license for its units in Riverfront Park. A city spokesman told BusinessDen last Friday that The Guild had not yet applied for one.